Special thanks to Mark Coker, CEO of Smashwords for his permission to use the material in this post. The front matter for your Smashwords ebook is simpler than the front matter for hard copy books, but is nevertheless important. NOTE: Front-of-the-book blurbs (testimonials) are not required for inclusion in the Smashwords Premium Catalog. In fact, there’s a potential downside to this step. If you add too much testimonial content to the front of your book, it can actually decrease readership because the reader doesn’t want to scroll multiple pages to start reading. If you add blurbs, keep them brief (see example below). IMPORTANT! Remember that many retailers have less generous sampling percentages than Smashwords, so if you add too much blurb content up front, a sample of your book won’t include any of your book’s content. If you add blurbs, put them at the very front of the book, before the Title & Copyright page. If your book has received rave reviews from readers, consider adding a couple short snippets on the first page, so readers who sample your book will feel more inclined to purchase it. These should be real, honest reviews. If you falsify the reviews and your reader feels tricked, they may seek retribution by giving you a bad review on Smashwords or at the retailer’s store. Nothing kills a book faster than bad reviews. On the first page of your book (unless you add the blurbs above), insert a Title and Copyright page. This page will look best if you center it. This page is required to publish at Smashwords. The copyright portion should be in English, even if the rest of your book is written in another language (it’s okay to list it in the book’s language too). On this page you identify yourself as the author and claim copyright ownership of your book (if you’re not the original author, or you’re not the exclusive publisher or distributor of this book, your book does not belong on Smashwords. Public domain books are not allowed unless you are the original author. Private Label Rights articles and other similarly scammy works are not allowed). TIP: Your title/copyright page is the first impression you make on your reader. Make it look professional. Center the title and copyright page (see this post to center the text). If you’re centering the text on this page, do not use any first line indents. Also base your text on Word’s “Normal” paragraph style (or a custom paragraph style based on Normal), and don’t use more than two different font sizes. Your ebook is published by you (the author or publisher) at Smashwords. It should say either Smashwords Edition on the copyright page, or “Published by [Authorname] at Smashwords,” (remove the quote marks), or, if you’re a multi-author publisher, Published by [the name of the publisher publishing it on Smashwords] at Smashwords. Although some Smashwords authors consider Smashwords their publisher, we consider you the publisher. Smashwords is your ebook publishing and distribution platform (see examples below). Avoid long copyright pages. Shorter is better because it allows the reader to start reading your book’s content faster. IMPORTANT! Do not write “Kindle Edition” or “Ebook available in the Apple iBookstore;” otherwise it won’t qualify for the Premium Catalog. This is your Smashwords Edition. Also don’t write, “Printed in the United States,” because this is your Smashwords ebook, not your print edition. Don’t confuse readers. 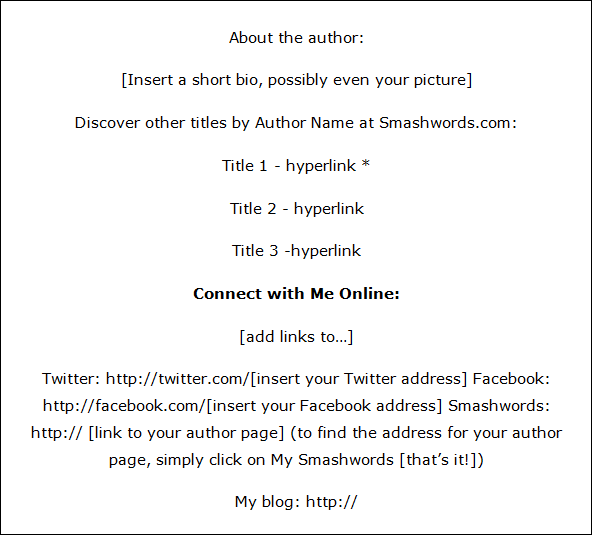 As a courtesy to ebook retailers who promote and sell your Smashwords Premium Catalog titles, please restrict your hyperlinks to only your Smashwords author page and book pages, or your personal home page or blog. Do not add hyperlinks to online ebook retailers that may compete with current or future Smashwords retail distribution partners. It’s not considerate, for example, to advertise your Kindle or Apple ebook in your ebook if it’s sold at Barnes & Noble. Such advertising will only alienate your retail partners, confuse your customers, and will cause a retailer to remove your book from their catalog. To minimize this accidental piracy, Smashwords encourage their authors and publishers to add the Smashwords License Statement to their book. The Smashwords License Statement is an original creation of Smashwords, and it has been widely adopted by thousands of ebook authors and even some competitors. The Smashwords License Statement acts as a Trojan horse. Even if your book is accidentally copied or shared, the recipient of the book is gently reminded of their legal and ethical obligation to compensate you for it. Most authors end their book with a period, and then give the reader nothing more. Don’t squander this opportunity. If your reader makes it to the end of the book, reward them! First, add a ### centered on the next line to signify the end. Next, consider adding a personal message. Put yourself into the mind of the reader. * Remember to make the hyperlinks “live” by highlighting the text you want to hyperlink, right-mouse click on the text, then insert the http:// hyperlink. Link directly to your personal book page at Smashwords. Make it easy for your readers to learn more about you. Be honest, that wasn’t so tough, was it? “Congratulations! You’ve carefully studied and implemented the formatting instructions in these posts, and now your formatting fun comes to a close. Now you turn your attention to final preparations as you prepare to unleash your masterpiece upon the world.” – Smashwords Style Guide. That takes care of the formatting of your book: the hard copy, PDF ebook, Kindle, and your Smashwords ebook. Starting with the next post we look at uploading your book to the main online publishers: CreateSpace, Amazon, and Smashwords. Take a break – you’ve earned it.